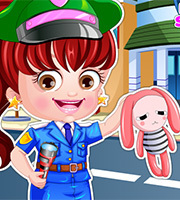 Description: How about giving a police makeover to Baby Hazel? Show off your fashion skills and pick the most stylish police-style outfit and accessories for Baby Hazel. A trendy collection of outfits, caps, shoes, shirts and dungaree. Take your pick!